Jacques Cousteau awakened the fascination for the submarine world in many of us. His film productions present the wonders hidden under the surface of the ocean, and yet they awaken curiosity for more. I think Monsieur Cousteau would approve of the way fellow Frenchman Antoine Bauza presents the underwater world in his game Oceanos: not as a place for warfare, like many games have done before, but as an object of curious discovery. 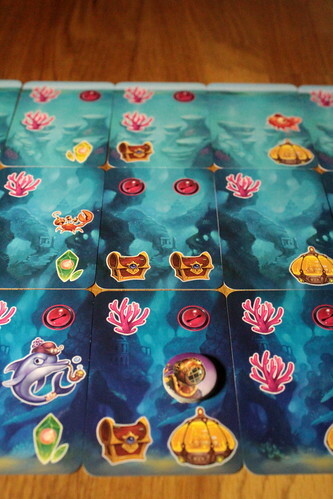 Each player in Oceanos gets their own submarine and their own little patch of ocean to explore. Or rather, they don’t get a patch of ocean, they create a patch they want to explore. Over three rounds, the players discover three levels of their personal ocean, starting near the surface and sinking lower every round. 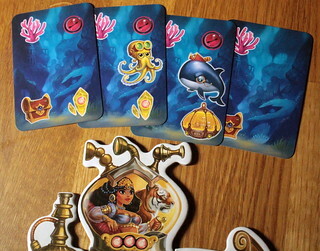 Each round has five turns, meaning that players place at least five cards at every level of their ocean. Those cards are selected with a variant of card drafting. A different player is the Captain for each turn. He deals two cards to every player but himself. All players then choose one of those cards and put it, face down for now, at the right end of the current level of their ocean. The cards they don’t choose all go to the Captain. He picks one of those cards to play. With four or five players, that means the Captain will usually have more cards to pick from than anyone else. But they’re all cards the other players didn’t want, so they tend to be weaker. In three players, the Captain will mostly have the same number of cards the other players do, but they’ll still be what everybody else discarded. That makes his hand generally weaker. But since the Captain role goes around the table it all balances out in the end. After the Captain selected his card, all players reveal their choice. The next player becomes the Captain and the next turn starts. The cards have a bunch of different things on them that you might discover under the sea. Only one of them has an immediate effect, everything else is important either at the end of the round or the end of the game. For instance, you will encounter a variety of adorable undersea animals you can catch for your aquarium. Each kind of animal is worth two points at the end of the round. Also on the cards are corals. They will score one point each at the end of the game, but only corals in your biggest, connected reef score. That makes the layout of your ocean important, not only at the current depth but across all levels. And that’s where this whole drafting thing becomes interesting: if you can deny the Captain a coral when he needs it, is that worth more than scoring points for yourself? Putting the right cards in the right place is just as important with treasures. On their own, treasures are worth nothing. To score points for them, you have to leave behind one of your divers to bring it up. Your submarine can carry three divers at most, but that doesn’t mean you can only collect three treasures. When a diver returns to the surface, he passes through the cards above him. If one of those cards happens to have a treasure he can pick it up on the way. Ideally, you arrange three treasures one above the other and drop your diver off at the bottom. There is a certain risk to that, though. You can only place a diver on a card when you play it, not later, and you can only place divers on cards with treasures. So if you don’t get a treasure on that bottom card, you lose the other two treasures above as well. That sounds like all you need to score is the right amount of luck. Draw the right cards, score points. That is true, to an extend, but you can help your luck along quite a bit by upgrading your submarine. The vessel consists of five parts, and each can be upgraded in two steps. That, too, depends on the cards you play. You can only upgrade at a base. That’s the one action you take immediately, the upgrade is ready for the next round. You are guaranteed to find a base at the end of each round. But each base is only good for one upgrade, so if you want that bigger boat you should hope for some cards with bases, too. Even at a base you have to pay for your upgrades. You do that with crystals, also found on the cards. The first upgrade for a component costs any one crystal, the second upgrade costs a green and a yellow crystal. And those Crystals have to be on your current level of the ocean, and there can not be another base between them. Getting that second upgrade is tricky sometimes. But what do those upgrades do for you? Depends what you’re upgrading, of course. 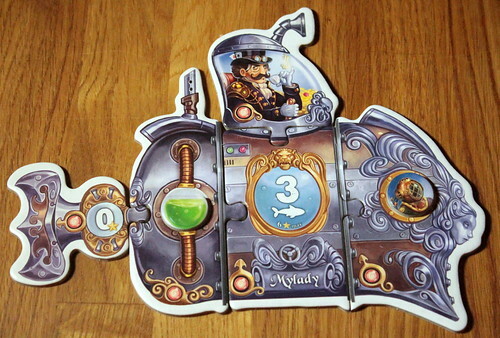 The three more immediately useful are the propeller, the aquarium and the airlock. The propeller awards you a straight two or five points at the end of a round, depending on upgrade level. In the aquarium you collect the animals you catch. The basic aquarium can hold no more than three, so you can’t gain more than six points from animals per round. A fully upgraded aquarium can hold eight animals. The airlock is where your divers wait to be called upon. Your basic airlock only has space for one, but with each upgrade you automatically pick up another diver. And more divers, of course, mean more treasures. That leaves two Upgrades. With each upgrade to your cockpit, you get an additional card per turn. Four cards instead of two is no guarantee that you’ll get what you need, but it sure helps. And so does the motor, the most tactical of the Upgrades. A basic motor only has one fuel token per round, an upgraded one two or even three. Fuel tokens are very useful, little things because they allow you to play more than one card per turn. Just put down another one, place the fuel token on top. Playing more cards is useful in itself already, because more cards mean more icons, more icons mean more points. But they have an even greater use. If you have a treasure this round, but you need it next round, well, you can hope that you get one again. Or you play a fuel token and play the treasure card second. Fuel tokens give you more control to put cards where you need them. You won’t be able to upgrade your submarine completely before the game ends. Or, if you manage, you’ll have sacrificed a lot of points. So you’ll have to make some choices. None of your options are obviously better than the others, they just bring you different advantages. That’s a generally great thing about Oceanos, there are rarely choices that are obviously bad. Sure, some cards will score more points for you than others, but what about the cards you pass on to the Captain then? Will they maybe be too useful for him? Is it worth a fuel token just to keep that card away from him? All those questions are not particularly tough to answer, but they have to be answered, and you have to answer them every round. With the short turns and all players except the Captain playing at once, that makes a lot of decisions in a short time. None of those decisions are overwhelmingly deep, but keep in mind that Oceanos is a family game made for ages eight and up. In that category, Oceanos really stands out for its number of meaningful decision. It’s a game that experienced gamers will enjoy playing with their family, and that is fun for the family as well. Easy to learn, quick to play, a good balance of luck and tactics, beautifully illustrated by Jérémie Fleury – I really can’t find anything bad to say here.